In Chinese Medicine, it’s believed that acne that flares up on different parts of your face represents health problems on different parts of your body. For example acne on your upper cheeks is a response to stress in your lungs or respiratory system. Smoking is but one of these causes (read on for more). 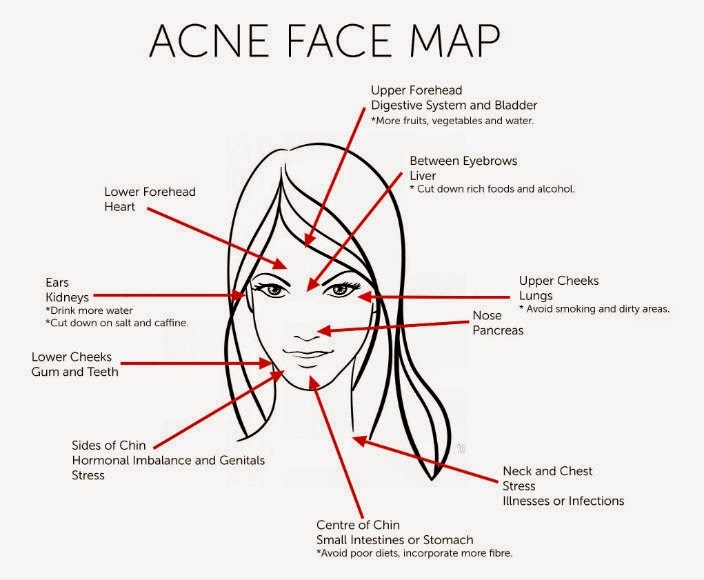 Therefore a good indication of which organs need attention and care is to simply look where your acne is. This especially affects women. Flare ups on the sides of the chin are a good indication of hormonal imbalance. This can be due to menstruation, birth control, or a diet high in soy. Sometimes, even emotional or physical stress can cause hormonal imbalances. Get plenty of sleep and make a habit of meditating or doing yoga to keep the mind focused and stress-free. Be sure to take lots of essential fatty acids such as Omega 3s. Follow this linkfor a list of foods rich in Omega-3s.